SYNOPSIS: In the final book of this gripping trilogy, Calla and her new team continue to find the rest of the pieces missing in the Elemental Cross needed to destroy the Keeper's Master, Bosque Mar. Having only Haldis's (Earth) hilt, Calla, Shay, Adne, Connor, Ethan, and the rest of her pack head in search of the 3 missing pieces, Eydis (water), Pyralis (fire), and Tordis (wind), and with the Keeper's protections in place, no one escapes each mission unscathed. But when Calla returns from Veil with her to-be Alpha, she's forced to choose who will be her alpha- Ren or Shay? However, being Calla she refuses to choose and its all she can do to keep the two apart before they rip off each others heads. But the time will come when she must choose- Ren, the man she's loved all the time in Veil, or Shay, the Scion who's new wolf inside isn't really new. Can Calla find the Elemental Cross pieces and end the war of the Nightshades vs. Banes without being killed? Can she save her pack before it's too late? Can she save her heart and make the right choice? REVIEW:WAAAAHHHH!!! Oh the ending!!! I can't believe it! I've liked the series since I've picked it up. 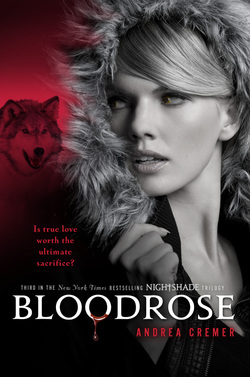 Didn't really love Wolfsbane (#2) and Bloodrose doesn't take the top spot of the first one (Nightshade). As always with the books, the middle has very slow momentum, compared to the beginning and end. Very dialogue-y and less action-y. Nonetheless, the ideas are fabulous and I'm in love with Calla! I am not much of a romancer, so Calla's dilemma of Shay vs. Ren went over my head. I did notice the book got into a little more PG-13 to R stuff in the romance department. Got a little annoyed at how many times Calla slept with the Alphas. I was so excited when the book picked up and just barreled through the rest. The end had me sad though! Recommended to Nightshade fans, Urban Fantasy nuts, and Paranormal Romance geeks. Random note: I read the book faster listening to Skrillex's album Bangarang! Fit the theme for me. SYNOPSIS: After spending all of his life traveling the world with his parents, gaining and leaving friends, changing schools frequently, and being anything but a normal teen, Mickey Bolitar finally gets to settle down in the US with his parents. After a horrific car crash that the family was in, leaving Mickey's dad dead and, by finding love through a needle, Mickey's mom in rehab. And just as Mickey's Sophomore year is about to begin, he meets a cute, shy new girl named Ashley, and Mickey's life is looking a little better. At least for that day. Ashley goes up and missing without a trace, leaving Mickey suspicious. Can he and his odd group of friends find out what happened, or will Mickey's "dream life" beat him to it? REVIEW: It was interesting, to say the least. Mysteries are usually not my forte, I'm not too sure how I got this book anyway! It was on my holds list and I have no idea why or how it got there. Despite this, I was intrigued. A teen with his life shattered before his eyes is usually all I need to try a book. And I devoured it! The book was fast-paced, and not lingering on details that weren't key. Best part? The conclusion MADE SENSE!!! I have read or watched so many mysteries where the conclusion leaves you scratching your head! Not here! Where the story went to make the conclusion, that was a bit odd and stretched. I've read better books where a historical connection is more strongly made. 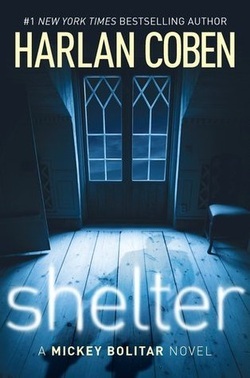 Some shelter in another country links to a WWII heroine, links to a society that shelters people. Not really doing it for me! All in all, a surprisingly good story. Very suspenseful with a touch of abuse and trafficking, which sealed the deal for me! Great for Realistic Fiction and Mystery fans. SYNOPSIS: It's 1962 and Eugenia "Skeeter" Phelan is home from college. Instead of listening to her mother and trying to find Mr. Right, she's looking for a journalist position and trying to stand on her own, but when she learns of her childhood maid and friend, Constantine, has left for good and her mother's cancer growing worse, her world begins to crumble, until a shocking idea hits her that threatens to destroy the rest of her world. Aibileen has been an African-American maid since seventh-grade, currently raising her 17th white baby. The children she raises with her white families is all the family she has left since her son was crushed in a work accident and died before Aibileen's eyes. All she can do is try to make it in this cruel world, and support her white children to become strong adults who accept African-Americans as equals. Minny is a feisty, independent black maid, who's snappy tongue can get her into trouble by her employers. But if there's something to remember Minny by, it's her famous cooking. Now out of another job because of her sassy ways, her last chance resides in a woman who the local League can't stand. Only if the rumors about Minny being fired doesn't reach her ears. Together, these 3 women with such diverse backgrounds will come together and create a taboo project that could put them in harm's way. But they are tired of Mississippi's racial lines, and lines are meant to be crossed. REVIEW: WARNING! Don't read without a hankie!!! My initial thoughts in the beginning was that this was going to be thick, slow, yet cute. NOT ACCURATE. There were slow parts, sure, but the details are interesting and deep. I loved all the characters and the book was written in the best way; Skeeter, Aibileen, and Minny had their own chapters in their own voice. Despite the book taking place in the 60s, the book didn't use much of that time period to set the lives of the characters. Since I had no chance of seeing what the 60s were like, the book wasn't a hit-and-a-miss, and it could've been, had it been written another way. A major plus that a book can be written so that someone like me, obsessed with our current time and technology, can read this and get it! A lot of people I've talked to about the book will agree that the movie was skimpy compared to the book, that the book was better than the movie. I partially agree. I had seen the movie first, then read the book and I found it worked best for me. Aibileen and Minny's parts are written in a Southern accent (eg. going to= gone), and normally, I CAN'T STAND THAT! It's why I don't really like Shiloh by Phyllis Renolds Naylor. BUT since I know what Aibileen, Minny, and Skeeter look like and sound like, the book ran a lot smoother. Myself, I was a fan of listening to Minny and Aibileen's trials as maids, rather than Skeeter trying to work it out with Stuart Whitworth. To hear the intimate detail of the maid's lives was far more interesting than someone of my own race and constantly hearing of the dating drama. As a white person, it's hard to relate to other races, but now that I get to hear this side, its incredible. When I finished the story, I had to read what Stocket was thinking when she wrote this. Once I read the last chapter about her, I saw the hidden lines. Stocket, growing up, had a maid who she loved. she had the relationship that Skeeter had with Constantine, and Aibileen had with May Mobley, and the fire of Minny, and the heart of the other maids. She can claim its pure fictional, but I see a hint of a biography in there. 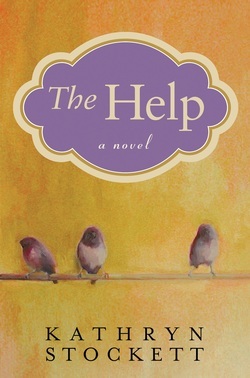 Recommended for chick book livers, and someone in need of a good read! SYNOPSIS: In 17-year-old Charlaina's world, society is divided by the language you speak. The smallest act of defiance is looking at someone speaking a higher language than your class. Charlaina- or Charlie- resides in the Vendor class, where she's only 1 class above the bottom of the chain. But she has a secret. She has the power to understand every language, be it spoken, or gestures, or code. So when she escapes with her friend to many of the illegal underground club, she meets a mysterious man, who speaks a language she's never heard, and he's intrigued by her. As tension builds between outlying countries and internal citizens of the capitol, will Charlie's secret be revealed, or will the war destroy her world first? REVIEW: I've never read anything by Derting before, and I've been waiting forever to read this book. A slight let down. I love the concept of segregation by language, and its not far-fetched at all! Everyday life involves segregation by languages to anyone who doesn't speak or understand English, in America at least. I wish that Derting had explored the classes more, though. The characters were okay. The descriptions came in the middle of the book, which was horrible because I already painted my own image, and there were MANY places to put the description. I didn't terribly love the characters, but they had a fire to each of their personalities. I was REALLY bothered by something. Charlie is real close with her friends, Brooklynn and Aron, even if it sounded like Charlie and Aron were enemies in the very beginning. So when the war pick up in the Capitol, Charlie had Brooklynn, but seem to completely forget about Aron! Not even a wink of worry! If I had 2 close friends, I'd be worry if a war was going on on our town, for me and my friends! GRRR!!! I feel the book was an okay read. Probably not Derting's best work, what with the hype of The Body Finders series. However, the concept of this kind of dystopian world is phenomenal and realistic. Recommended for Dystopian fans. SYNOPSIS: In a co-produced graphic novel, Guy Montag's world is revealed. Montag is a fireman in a futuristic world. He loves his job; burning books and the houses that held them. Firemen aren't needed to stop domestic fires anymore, now that every house is fireproofed, and now work to enforce the Million Banned Book list. Anyone caught with a book is arrested and has their books and house burned. But when Montag gets curious and brings a book home, its the beginning of Montag's revelation. Now, after his wife has attempted suicide and his new, strange neighbor has disappeared, Montag's eyes truly open to his world as he realizes the heavy censorship place on his society. But can he survive before he has a chance at a new life? Despite this book being supervised by Bradbury, a lot of what made Bradbury's book interesting and realistic is almost censored in this graphic novel! The metaphors and spot-on dialogues that made this book an eye-opener, were gone. The book now became just a story! The animations weren't really even accurate! The graphic adaptation used exact dialogue and narration from the book as if it was ripped from it. At least that was there. I am just so upset that the work that made Fahrenheit 451 more than a fiction story wasn't included. HOWEVER! THERE IS HOPE! If there's anything to take away from the novel, its the introduction! 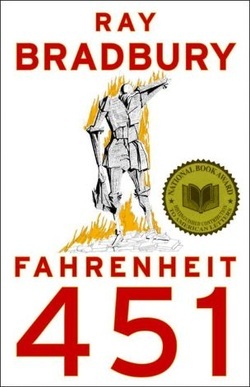 Written by Bradbury himself, we're told how the story for Fahrenheit 451 came to be, and its AMAZING! We're told how Montag is truly Bradbury himself! All in all, I'd recommend reading it for A) the introduction and/or B) if its hard to visualize the story as you read the original. Its a great cheat, but the original just cannot be matched. SYNOPSIS:" Happy Hunger Games! And May The Odds Be Ever In Your Favor!" 16-year-old Katniss Everdeen lives in District 12 in Panem; the fractured country that took over the lands of North America after an Apocalypse. She lives with her grief-stricken mother, over her father's death years ago, and her 12-year-old sister, Prim, who Katniss would die twice over for. The Seam is one of the poorer Districts with little food and where starvation is a common form of death. The Everdeen family survives by Katniss's illegal hunting outside the District fence, making her a master of the bow an arrow. The Hunger Games are coming soon, and the Reaping is only a few days away- where they select "tributes" to go and fight to the death in an arena with the other districts tributes until a district winner survives. No one ever thinks they'll be chosen-after all, there's over a thousand names in there, but when Prim gets chosen in her first Reaping lottery, Katniss volunteers to go in Prim's place. Now its up to her to survive the Games to save her District and her family. 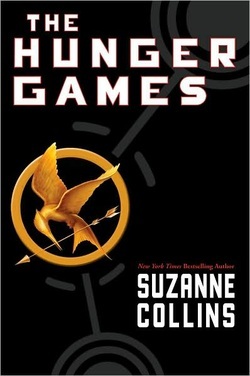 Can she survive the games, and become the first winner for District 12 in more than 30 years? REVIEW: I originally hated this book after reading the first pages and was bored with the dialogue of the cat. I left it to sit on my bookshelf for the rest of time. Then a celebrity loved it, who my mother loved, and I was made to read it and discuss. I fell in love. This book, once the history of the setting started, had me head-over-heels, reading until 2 AM. A horrific dystopian land, similar to settings I imagine in Africa, where savagery is a hairline away. The Capitol rules Panem with an iron fist that snatches teens away, as a reminder to the citizens after a revolution, that "we can take your kids and make them kill each other". But where poverty reigns the outer Districts, the Capitol and the first few Districts can't fathom hunger, and all are a wealthy display of colors and designs in lavish homes with servants and no need to lift a finger. REALLY similar to the setting of America and the world. I hear this a lot now with the movie: "Katniss doesn't look like anything from the book in the movie!". I felt I didn't even get a good description of Katniss from the book! I know she has a long black braid, possibly tan, probably tall with muscles, that's it. I felt the descriptions were a bit weak. I also never truly saw Peeta or Gale. I understood the backdrop to everything, but the biggest problem for me was the Hovercraft! I could never figure out what it looked like!!! Was it open? No it was like a floating house. Could it be that big? SO MANY QUESTIONS! This story was just an amazing experience, not just a book, of love and loss and fear and poverty and luck and wealth and everything! I felt Katniss as she felt. I laughed and cried and wanted to throw the book at a wall, then couldn't fathom closing it and wanted to live in the Capitol and try the foods, then protect Katniss and tell Peeta everything! I was very involved in this book and I love it as much as I do love Roth's Divergent! Definitely a must-own for Dystopian obsessees, and someone looking for an outdoor thriller!!! I also found this and thought it was awesome! SYNOPSIS: The temperature that book pages burn is 451 degrees Fahrenheit. Guy Montag is a Fireman and enjoys his job. He loves seeing the books burn and the houses that held them. In Montag's world, the one million banned books list is enforced heavily, and anyone caught with books is arrested and has their books and house burned, which is Montag's job. He lives with his wife, Mildred, in a loveless marriage, who spends the day with her parlor "family", and has little in his life to look forward to. Then, he meets his neighbor, a lovely and eccentric girl named Clarisse, who opens his mind to the reality of the world. But when Clarisse disappears and Mildred tries suicide, Montag begins to ask unanswerable questions, and begins to read the books he used to love to burn. Now that he sees the society he lives in for what it truly is, he now has to run for his life. REVIEW: I was reading Lord Of The Flies at the same time as a class book read (WHICH IS AWFUL!!! ), and despite that classical-book-language in some parts, its another amazing Dystopian thriller that came decades before its time. Its also one of the more accurate futuristic books I've read. FOR REAL! We ban books for ridiculous reasons and burn books we disapprove. 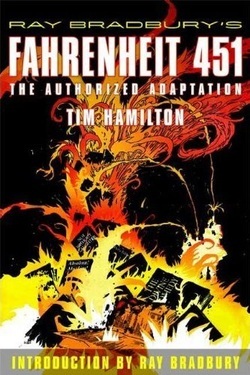 It may not be as extreme as in Fahrenheit 451, but its still bad! Some people don't get to read Harry Potter! I actually had a hard time with visualization. The description was minimal, in my opinion, and left the reader to fill in the blanks. Like I pictured Montag in an apartment, then a house, then surrounded by apartments like in the movie Up, then in a suburb! However, I focused more on the symbolism in the book and the metaphors. I loved this book and the idea for it. However, I'm not and English scholar, nor am I looking to be one, so I'm not going to analyze the book word for word. I feel the book has more of a point rather than a storyline. Otherwise, there would've been a sequel. While I do recommend it for Classic lovers, I recommend it for Dystopian fans who LOVE books. The language is smoother and less "classical", which is a big part of why I gave the book 4 stars. Would've been 5 if the story had even more of a storyline! SYNOPSIS: Eric Calhoune, a High School-er who used to be the fat kid but now is an amazing swimmer, has been friends with Sarah Byrnes since Junior High, and is almost her only friend since she lives up to her name. Sarah said she had pulled a pot of boiling water off of a stove when she was 3 and her dad wouldn't pay for reconstructive surgery, and has lived as an outcast since. Now, she sits silent in the local psychiatric hospital, and no one knows why. Can Eric get through to Sarah and find out why she's mute before its too late for both of them? REVIEW: I never thought I'd be so in love with this book. 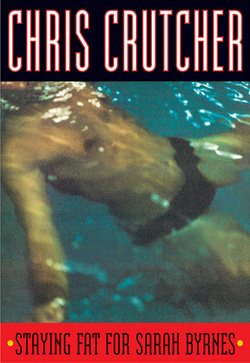 One of my book clubs wanted to read this out of curiosity, or course, and the fact that Chris Crutcher was coming for a talk in my town. A lot of people in my book group agreed that the beginning of the book was rough- but necessary. It had a lot of back and forth of the character's history and introductions and was a bit rough with description and structure. However, when you work past this, the story picks up and FAST. I loved the characters and they weren't 2D. I had a hard time capturing Eric completely, maybe because I'm a girl, or the book is too close to him to be able to step back and observe Eric. I loved Sarah, but if I say why, I might give some parts away. Same thing with another character and swimmer, Mark Brittain. Its so hard to talk about the book without reveling stuff! The book was an amazing read not to be put down. I was up till 2 AM reading the last half because the action never stopped! Recommended for darker realistic fiction lovers!